being little • bristol uk fashion & lifestyle blog. : christmas helpers: decoration. I love the ideas above - dipping feathers in glitter & creating a Christmas song banner may not be the first things that spring to mind when decorating for the festive season, but I think they look amazing! Having dried fruit hanging around your home is very traditional, but I think you can make it look modern if you wish, as the shapes are often so simple. I love Christmas trees. Everything about them - going to the farm to choose one, the smell in the car on the way home, taking the netting off and watching it spring open, decorating it in my very particular way... but if they're not your thing, how about these? 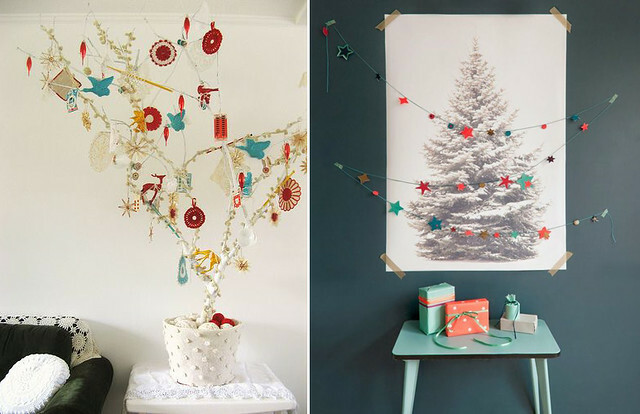 Painting a branch white and decorating with colourful handmade ornaments is a very personal and pretty way to interpret your tree, or if you prefer things a bit more minimal - a poster of a fir tree with a simple garland strung across. 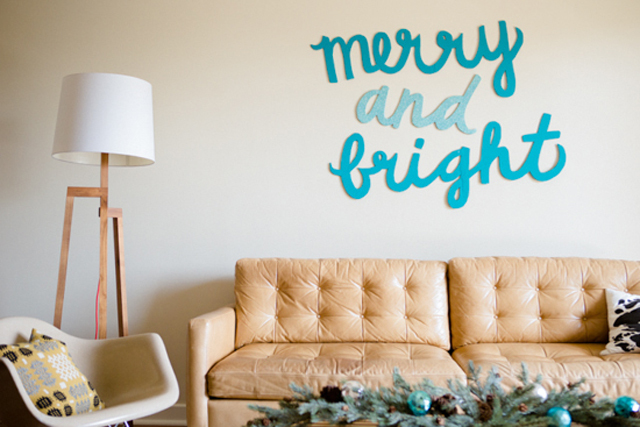 I'm quite the fan of having things written on the wall, so I love this unusual "merry and bright" wall decoration on Paper & Stitch! It's perfect if you have lots of wall space that is looking a little bare & un-Christmassy! It sounds like this pom pom wreath was a lot of work, but it looks so cute! It's easy to get stuck in a colour rut at Christmas (red, green & gold..) so it's refreshing to see some candy coloured decorations. Read more about Danielle's decorations here. I love a good wreath on the door, welcoming you in. I imagine that this rosemary wreath on The Pretty Blog would work best indoors, as it would smell amazing! The look of it is so simple as well, it's just perfect. If you don't like that wreath idea, how about these? There really is one to suit any taste and budget, whether that be low budget with pegs or found foliage, or if you can afford to spend money on pretty feathers, flowers and fruit.. go wild! 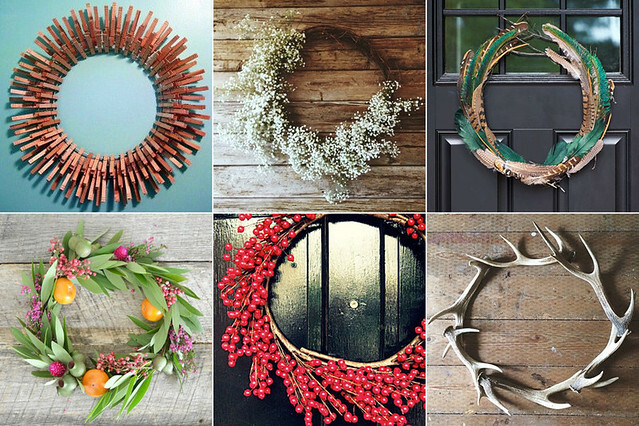 Also, if you happen to have some antlers lying around and want to make me a wreath out of them, go for it. Finally, some jazzy baubles you can create at home. Either buy polystyrene balls and decorate with fabric, sequins or beads, or buy pre-made baubles and cover in lace! Gorgeous, unique decorations that you can proudly tell your guests that you made! 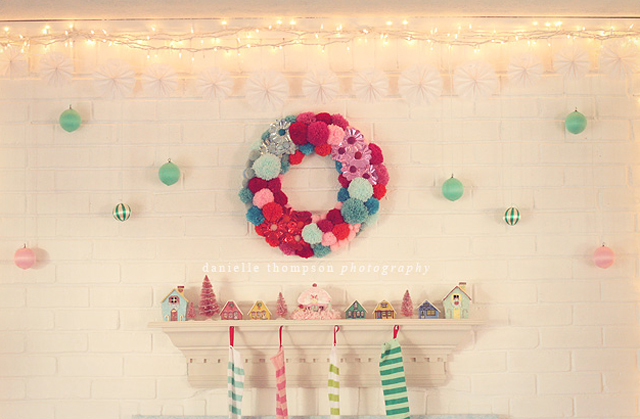 There are lots more festive ideas and DIYs for the above on my Christmas Pinterest board! Finally, a shameless plug - these cute little handmade stockings are available to buy in the Being Little Shop ready for you to stuff full of treats for your loved ones, or just hang above the fireplace to look pretty! I love these alternative decoration ideas! I wish I'd have seen them before I put ours up (part of which is tinsel... oops). I might try the dried fruit because I imagine it makes your house smell beautiful! I love all of these photos!! I adore Danielle's mantel!! We decorated with lots of pastels this year too!! Red + green is just a bit too traditional for my taste!! Not a big fan on tinsel either, especially when it's in big doses! I have yet to fully decorate my house so thank you for the inspiration! I'm such a Scrooge when it comes to Xmas and decorations, so something like the poster might be as far as I go. Here here to tinsel hating. I especially the hate fat bronze/gold coloured stuff. Eugh. My favourite idea here is the star garland. I might give this a go... one day!